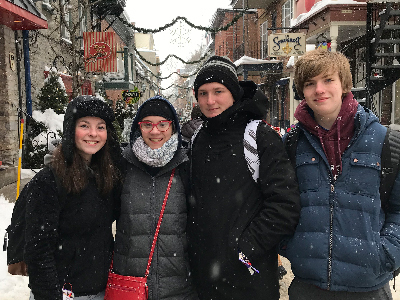 Earlier this year, french students from the Warwick High School took a trip to Quebec.The trip was an opportunity for students between 9th and 12th grade to be immersed in and experience french culture, such as food, music, history and of course — experience practicing their language skills. “I wanted the students to see that they can use their french skills in the real world,” stated Renee Campeau, French teacher at the Warwick High School. The students gained confidence in their french speaking skills and in themselves as the weekend progressed.For some students it sparked a love for traveling while discovering and understanding a new culture. During their trip to Quebec, Warwick High School students had the chance to visit the Montmorency Falls, have a history lesson on the Plaines of Abraham, enjoyed a walking tour of Quebec city, and visited an ice hotel all while practicing their french speaking skills.